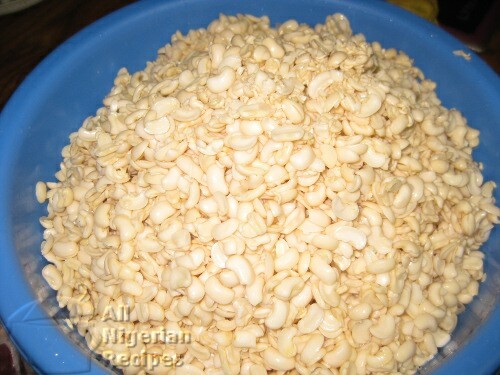 There are many ways to remove the outer coat of black-eyed or brown beans before it can be used in cooking the Nigerian Moi Moi, Akara or some Nigerian kids recipes. 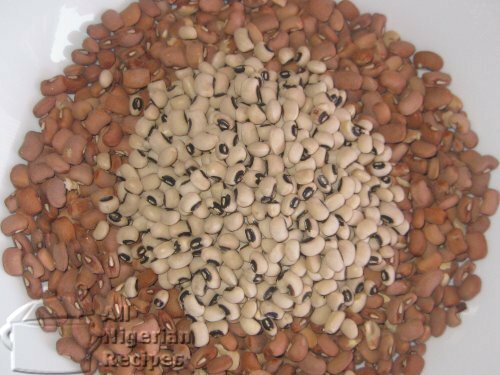 For all the methods of removing beans coat, you need to first of all soak the dry beans seeds in water for some time. This length of time will depend on the type of beans. But as soon as you can easily remove the beans coat by rubbing a few of them together in your hand, then the beans is ready to go “coatless”. The first method of the beans coat removal is by rubbing the soaked beans between your palms till all the coat has come off of the beans seeds. This method is quite tedious and can take hours on end. The second method is by using a food blender. The third method is by using a mortar and pestle (as shown in the video below). Soak the beans in cool water till you can easily get the beans coat off by rubbing the seeds with your fingers. You will notice that the coat is baggy and separated from the beans seed. If you leave it for too long in the water, it will become more difficult to remove the coat from the beans. Once you have confirmed that the seeds are ready for the beans coat removal, drain the water from the beans else the seeds will continue to soak up more water. Then scoop a small quantity of the seeds into a mortar that has some friction. Use a pistle to rub the beans seeds against the insides of the mortar and watch as the coats come off the seeds. The very smooth mortars will not work here because you need the friction to get the coat off the beans. Repeat this process for all the beans seeds and put the removed ones in a large bowl when done. Pour a generous quantity of water into the bowl such that the beans coat are separated from the seeds and they float on the water. Decant the floating beans coat, pour more water and decant. Repeat the process till all the free beans coats have been removed. You may have some stubborn beans coats that did not come off the beans seeds. Hand-pick these, place in a mortar and rub off the coats with a pistle. Wash as before till you have clean completely coatless seeds. Soak the beans for about 3 hours before blending. If you have any questions about this cooking task, click here to ask me. Use peeled beans to cook Nigerian Moi Moi or Nigerian Akara.